Bulk up this meal and serve it with quinoa (pronounced keen-wah). Cook it just like rice. Cook 150g quinoa in 300ml boiling vegetable stock for 15 mins. 1 Preheat grill to high, put salmon fillets onto a lined grill pan, lightly season with black pepper. Brush salmon fillets on both sides with sesame oil and sprinkle on the sesame seeds. Grill salmon for 10 mins, turning as needed, until cooked through. 2 Quarter avocadoes, remove stone, peel away skin and slice. Divide avocadoes, tomatoes and rocket leaves between four plates. 3 Whisk together balsamic vinegar and olive oil and drizzle over salad. 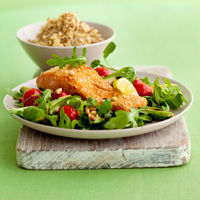 Top with salmon and scatter over the pine nuts.